Shred Guitar Riffs, Pantera "Drag the Waters" - Free Pantera Shred Guitar Riffs! This free Shred Guitar Riff is "Drag the Waters" by Pantera. Here's' the 1st part of the intro to the song. The 1st part is simple because it is in drop D tuning. For the 4th - 8th measure add in some bends, hammer ons & pull offs and you are finished. 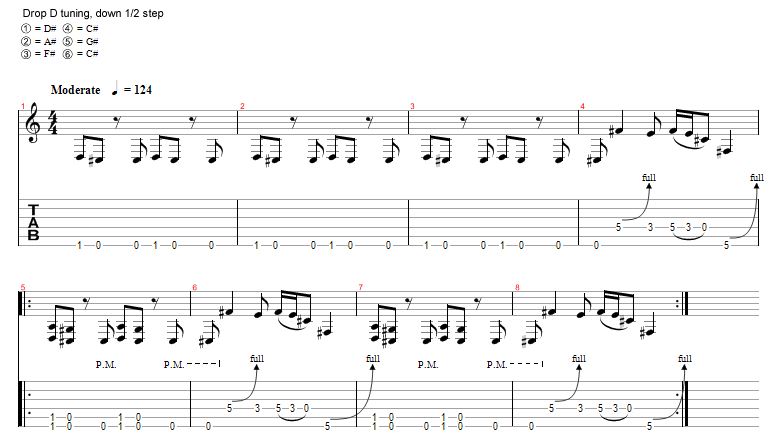 Remember to tune your guitar down 1/2 step and Drop D tuning to play this shred guitar tab below. If you need a refresher then check out the tuning page to get your guitar in tune and ready to play. With this lesson you can learn to play "Drag the Waters" by Pantera. Pantera Shred Guitar Riff - "Drag the Waters"